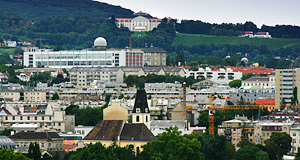 From many spots in Vienna you can see the hills that surround the city - they are on the outskirts of Döbling, Währing, Ottakring and Penzing, to a lesser extent Hietzing. In Ottakring, there is a very striking landmark: A huge neo-Classical Palace, right on a hilltop, surrounded by vineyards. The closer you get, the more impressive it is - this is Schloss Wilhelminenberg Palace. The first palace on today's Mount Wilhelminenberg was built at a time when Ottakring was still a municipality far away from the city of Vienna. In 1781, the local landlord Count Franz Moritz of Lascy purchased the property near the Predigtstuhl hill and started to build a leisure palace that he didn′t name explicitly. The Count of Lascy was friends with the Russian ambassador to Austria, Prince Demeter Gallitzin, who bought the property in 1784. Prince Gallitzin bought additional forests and meadows in the surroundings of the palace and made himself liked by becoming a local philanthropist. When he died in 1793, the people of Ottakring were seriously upset. His heir was Count Nikolaus Petrowitsch of Rumjanzow. He sold Schloss Wilhelminenberg and the property changed owners a few times until 1824. Then the French Prince Julius of Montleart and his wife Maria Christine bought Schloss Wilhelminenberg Palace and the surrounding lands. He had the leisure palace built bigger by adding two more wings in the neo-Classical style of the original building in 1838. The Prince of Montleart died in 1865 and his heirs argued about Schloss Wilhelminenberg. The palace did not have this formal name at this time and the hill was called "Gallitzinberg", named after the popular Russian ambassador. Hill is made the "Wilhelminenberg"
Schloss Wilhelminenberg was finally sold to be able to divide the heritage and the son of Prince of Montleart, Moritz, bought it for 125,000 gulden coins. He gave the property to his wife Wilhelmine - thus, he wanted the entire area be called "Wilhelminenberg". By this time, the hill was registered as "Gallitzinberg" and his wish to re-name it was not accepted. Therefore, Moritz of Montleart had plates being made that he placed everywhere on the hill - saying "Wilhelminenberg" and "Schloss Wilhelminenberg" for the palace. It was only a matter of time until the locals got used to the name and picked it up. Prince Moritz of Montleart died in 1887 and was buried in a neo-Gothic chapel near the palace. His widow followed the local tradition and was active as a philanthropist - she is still known in the area as the "Angel of Mount Wilhelminenberg". She died in 1895. Her grandson Archduke Rainer of Habsburg-Lothringen was the next landlord of Schloss Wilhelminenberg. At this time, Ottakring was already part of Vienna, but the mostly 18th century palace was in very bad shape. It was demolished in 1903 and until 1908, a brand-new Schloss Wilhelminenberg in a neo-neo-Classical style was built according to plans by Eduard Frauenfeld and Ignaz Sowinsky. The following years remained turbulent: Archduke Rainer died just before Empire in 1917, and his nephew Archduke Leopold Salvator became the new landlord - alas, one with fairly little interest in Schloss Wilhelminenberg. Continue with "Schloss Wilhelminenberg - Part II"